The rug of the month April is part of the new Svarga Collection and draws everyone's attention with its elaborate design. Refreshing accents in green, red and yellow meet on a calm basis of earth tones and blue-gray nuances. The design Svarga SV01 was one of the selected representatives of this precious collection at this year's imm cologne and caused a surprisingly large crowd at the Mischioff booth. Below we have arranged the special features of the high pile silk carpet. Let us convince you! When soothing beige and brown merge into cool blue-gray and silver-gray, combined with cheerful splashes of colour, a decorative work of art is created. With the Svarga SV01, the Mischioff designers have succeeded in uniting the elegance of a silk carpet with creative freedom. The result is a sassy statement for those who have the courage to dare to do something new. The partly flowing, sometimes contrasting transitions between the colour palette produce a modern-abstract overall picture. The base is characterized by beige, brown and blue-gray and silver-gray nuances. It gives the complex design balancing calm, while the punctuated parts in yellow, green and red set welcome highlights. The balance brings harmony without being boring. The perfect symbiosis. The outstanding feature of the collection is the high pile of up to 22 millimeters. Thus, the Svarga SV01 and the currently four other models of this design line clearly outperform alternative silk rugs from the Mischioff range. By comparison, the pile of carpets from the Sichouk Collection reaches a maximum of ten millimeters. High pile carpets optimize the acoustics through sound-absorbing functions and stand for inviting cosiness. A design rug for discerning customers not only has to convince visually, but also haptically and qualitatively. The Svarga SV01 convices in every respect, which is partly due to the material. Mischioff uses real silk for the Svarga Collection, because this natural fiber has superior benefits. For example, its sheen is incomparable and makes the textile home accessory shine elegantly. Depending on lighting conditions and viewing angles, surfaces shimmer individually. Also worth mentioning is the excellent absorption of colour pigments as well as the brilliant reproduction of the finest shades. The haptic benefits from the gentle surface structure, which makes the pile extremely soft and cuddly. Every touch is a compliment to the sense of touch. The high knotting density, which is possible due to the fine silk fibers, stabilizes the rugs and provides around 160,000 knots per square meter for a high weight. The latter is responsible for a reliable grip when walking. Not to forget: The tear strength and dimensional stability of silk. The natural fiber transforms Svarga rugs into durable and sturdy companions. The Svarga SV01 is hand-knotted in Mischioff's Nepalese carpet manufactory. Each step is done in careful manual work, from spinning the fibers to finishing. In addition to the exclusive materials, it is traditional craftsmanship that gives the manufactured goods their premium quality. Without the commitment of knotters in Nepal, the luxurious designer rugs would not be feasible. Mischioff exclusively presents certified fair trade products. With the purchase you promote the fair trade of handmade carpets and a sustainable production. Details can be found under Production & Fair Trade. Order The Svarga SV01 in Custom Size! With the Svarga SV01 you round off the range of your retail assortment. Offer your customers a unique haptic experience and inspire art lovers with a colourful look! Also in the object and project area you are well advised with our rug of the month. The positive feedback from the visitors of the imm cologne has shown that the Svarga Collection has immense potential. Since customization is possible in addition to a common standard size, you can adapt the format to your needs. Get in touch today and let us know your ideas! You need decision support? Probably samples are the solution to convince all senses of the quality. To find out if the design of Svarga SV01 harmonizes with a specific interior, we recommend our virtual sampling service. Further information can be found in the service section. 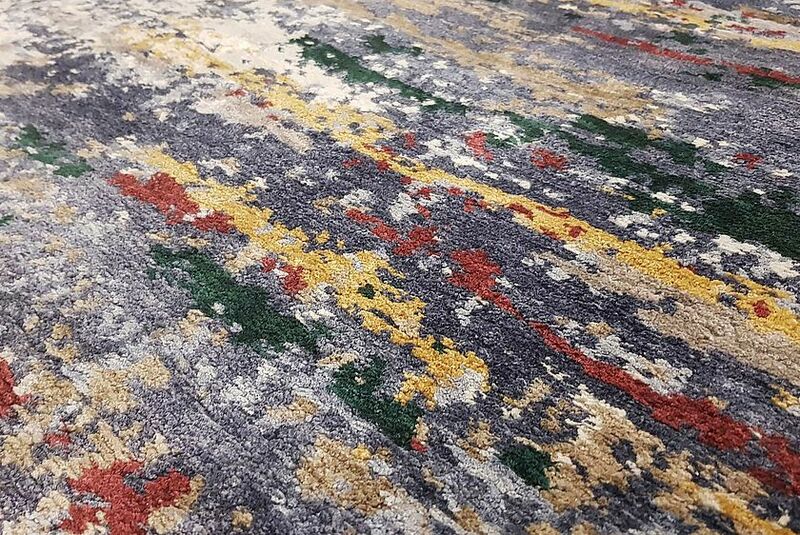 You can find more attractive silk carpets or material blends with 30 percent Himalayan highland wool in the Sichouk Collection or Nilanda Collection. All variants of the two product lines can be ordered on request as Svarga high-pile carpet. The current stock can be viewed in our online catalog. After the non-binding registration you will find there all Mischioff collections and designs. The Svarga SV01 is your favorite? 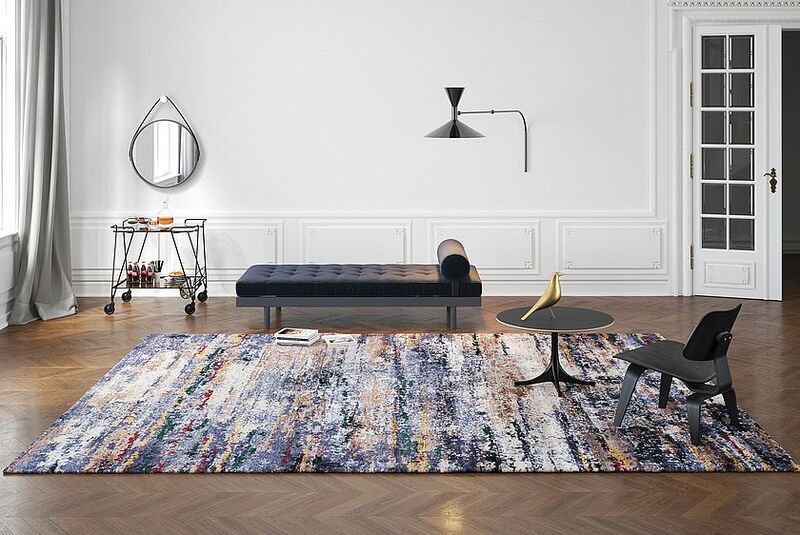 Use the retailer search to find regional distributors to purchase the rug. On site, you can be competently advised about our collections. Due to the variety of colours in the design, we advise against restraints on furniture and decorative objects. 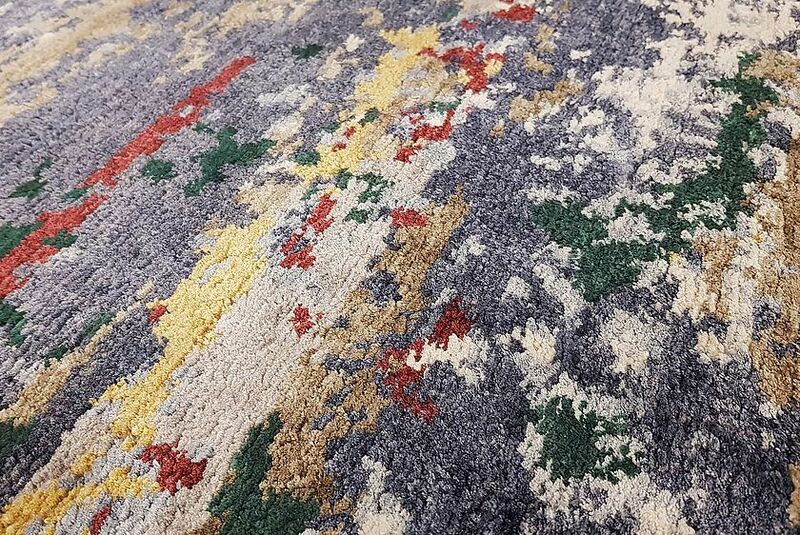 Grab the colours of the carpet to make the interior tasteful! Tips on proper care can be found on the service page. For more inspirations, order our free catalog or request samples via the contact form!